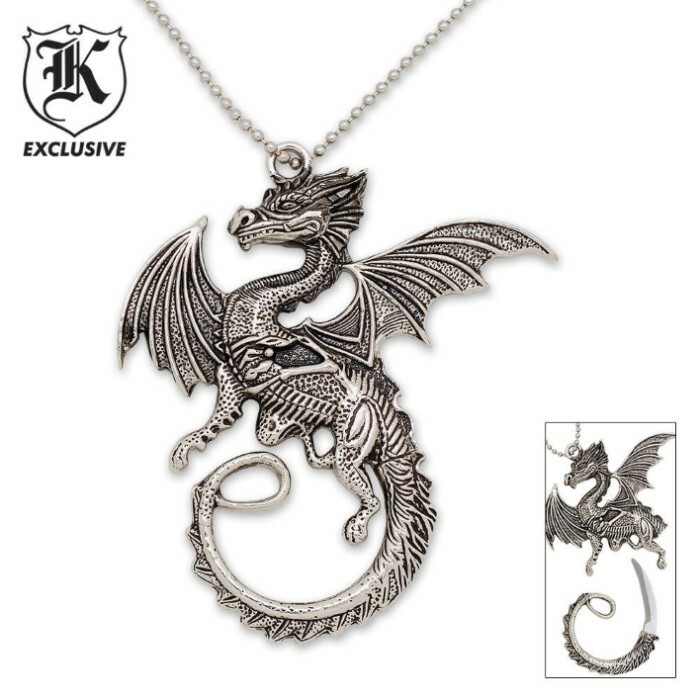 Coiled Dragon Necklace | BUDK.com - Knives & Swords At The Lowest Prices! 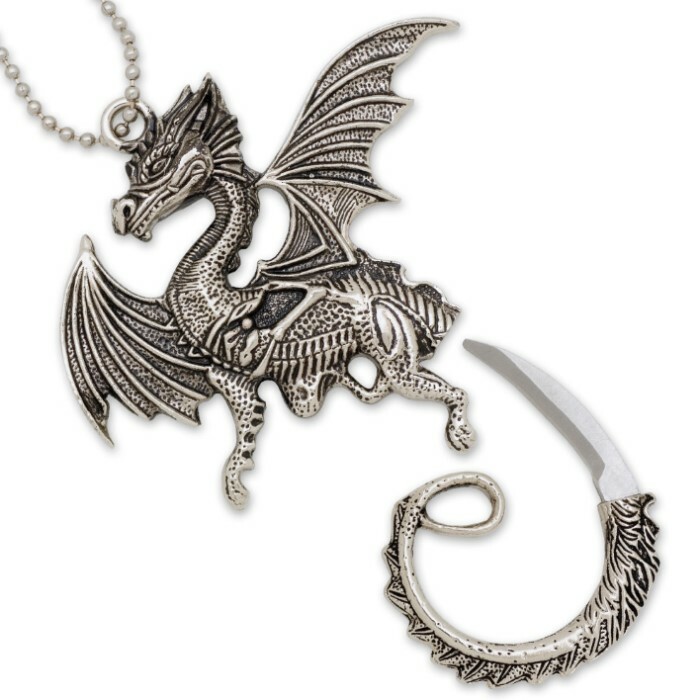 Bring on the bling with this snazzy cold cast steel dragon necklace. Not only does it look cool, but take a tug on his twisted tail and voila! You are now holding a piercing blade that fits in the palm of your hand. There is nothing wrong with it as far as quality goes...my only issue with it is it was bigger then I expected.. Like I would not wear it around my neck..ever. But if you are ok with wearing a pendant the size of a floppy disk then this is for you. I'm not going to lie its cool. I just wouldn't wear it personally. Blade fell out very first day i wore it and ended up losing it. Also the blade dident fit in very well so you could tell there was something different about the tail. Not impressed with it at all. this is a nice necklace. looks good, feels good i haven't had any problems with the blade falling out, either however, the blade is REALLY hard to get out until you've gooten it out and oiled it a bit. or at least that's what i had to do. You need points, man, to keep the wife off 'ya about all that money you spend at BUDK. Throw in something for her once in a while you'll love the peace. She liked this one and you know, so did I. Got one for myself even though I, generally don't wear necklaces. EXCEPTION= still wear my ARMY dog tags but then you guys do too, right? Buy it for her! IT'S WORTH THE MONEY!! 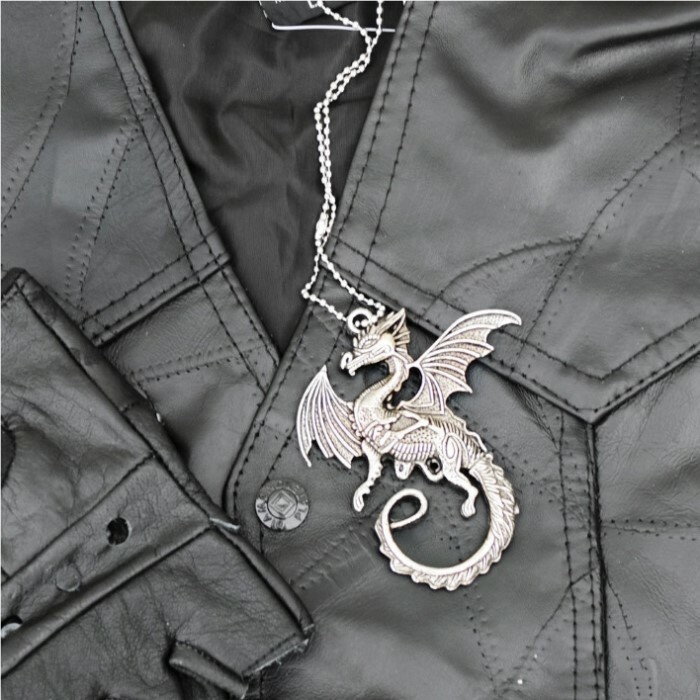 I like the dragon, but I did not get a chain with it so can't wear it yet. The tail keeps falling off so I can't wear it. Thinking about gluing it on. My wife loved it when I put it on. It is well crafted and the blade slides in effortlessly, fits very well. Fantastic addition to my collection. The necklace is everyrhing that i was hoping for and more i will tell all my friends about how nice and good the necklace knife is an i will be looking at the other necklace knife to add to the ones i already got. Thank you clyde shupe. P.S. have a happy new year. Sipping was great! However the blade of the dragon tail was not was i expected. First it was extremely hard to get the blade out and when pulling it out it dull the blade because it did not sit well. The blade itself does not sharpen easy and by it awkward shape its not the easiest thing to use. But all in all the dragon and blade look pretty good. Your bound to impress someone with if they have never seen one .